There was a new red dawn in London on June 24, 2016. 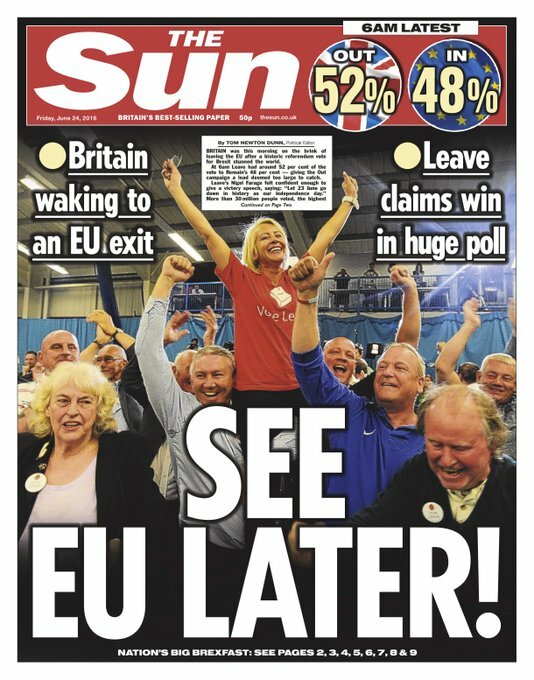 Voters in the United Kingdom voted to exit the European Union. 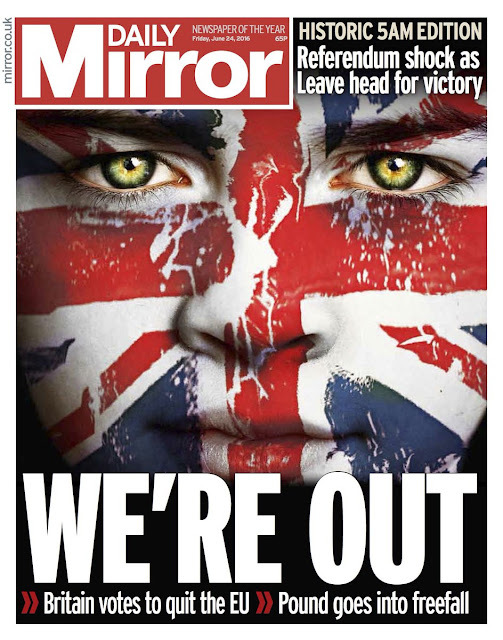 Britain has voted to leave the EU, a shock development with profound implications for markets and economies around the world. After a long night of vote counting, CNN, along with major UK media outlets, called the race for the “Leave” campaign. It leads by more than 1 million votes with 90% of districts reporting. Markets are a bloodbath: The pound has already plunged more than 13% to below $1.33, its lowest level since 1985. London’s main stock index is also set to tank when it opens for trading. In Asia, Japan's Nikkei tanked 6.7%, and Hong Kong's main index dropped 3.7%. Futures suggest that New York is also in for a rough trading day. Investors are searching for safety: Look for gold and U.S. Treasuries to spike as money pours into perceived safe havens. The big takeaway? This isn’t a one-day event. Britain’s decision to depart from the EU has injected huge amounts of uncertainty into markets, and it has the potential to upend Europe’s established political order. Buckle up! In what part of Red Dawn does this #Brexit thing take place again? ~ @BarefootBoomer (an US Army strategist). Now for wrath, now for ruin, and a red dawn. ~ @ActuallyAisha. June 24th is St. John's Day. Give a hug to your favorite Ufologist. Lots of them die on this date. As I have mentioned often, the date of the "first" sighting in the "modern era of flying saucers" is June 24th, and it is especially linked to the "Deaths of Ufologists," including a loss as recently as 2015. Watch the news today and in the forthcoming days to reveal what happened today. I saw something like this on the horizon. See my June 17th Red Dawn Alert and the followup on June 19th. In the short term, this has just begun. See "U.K. 'earthquake' crushes global markets." David Cameron has resigned. More to come. I'm much more interested in the fact that Waterloo, which was in Belgium, was 18 June 1815. You mentioned 'red dawn', which started me thinking about June of 1816 - the Year Without a Summer, due to the catastrophic eruption of Mount Tambora in April, 1815. Interestingly, 10 days after Tambora erupted, Napoleon escaped Elba. The sunsets created by Tambora, by June of 1816 were spactacular. In June, 1816, bored, the weather miserable, George Gordon, Lord Byron, and his guests at Lake Geneva were so bored by the horrible weather they dared one another to create something horrific to read. Byron's physician, Dr. Polidori, created a tale about a vampire, which eventually morphed into the modern vampire genre. His other guest, a young woman wove a tale about a creature created from parts of dead men. Two years later Mary Shelley published the book as "Frankenstein", or "The Modern Prometheus." The economic conditions created by the weather, that June of 1816 almost created a massive war in Europe. I think the only reason it did not happen is because England, as well as the other nations of Europe were basically broke after the long war with Napoleon. England survived and went on to become the most powerful nation on Earth. I have no doubt the UK will survive, quite nicely. FYI: I'm still celebrating the vote. Perhaps a stretch but it is how it appeared on the cover of Economia monthly. I do see this as a turning point in history. The decline of the European Union will benefit the far right and a return to nationalism might well be on the way. I live in the UK an hour outside of London and it seems to give the resentful, racist, undercurrent greater carte blanche to 'take their country back'. It is a sad day and when I finish my studies here rather than move to London - as I had planned - I will go somewhere else within the EU.